A beautiful photo pendant keeps thoughts of loved ones close – and it makes an unforgettable gift, no matter what the occasion! Our Oval Photo Necklace is a favorite, thanks to lots of little touches that make it unique. The look begins with a picture necklace, which is made using an image that you upload. Once you’ve shared your image with us, decide whether you’d like to add a special message to the back of the pendant, and our artisans will make your customized treasure complete. 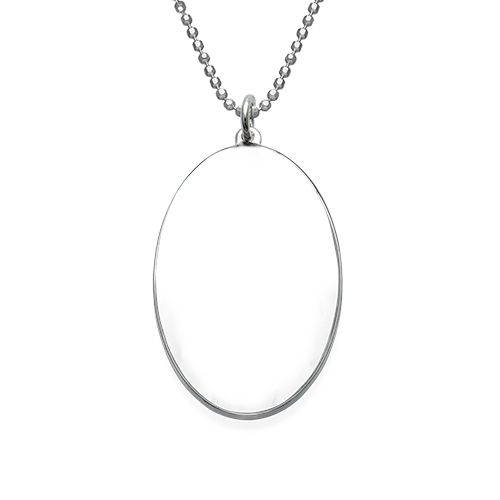 This beautiful pendant is made with 0.925 Sterling Silver, and hangs from a matching 0.925 Sterling Silver bead chain. We invite you to view our collection, where you’ll find even more photo jewelry to wear and share! Measurements: 20 mm x 32.2 mm / 0.78" x 1.26"